CMS Compliance Group’s President Linda Elizaitis and Senior Consultant Keith Reilly led a LeadingAge New York audio conference on Tuesday, May 8th that centered on the Quality Indicator Survey’s Kitchen Observation and Dining Observation and some common citations that facilities are receiving in these areas. The Dining Observation includes a broad list of focus areas, including Dignity. 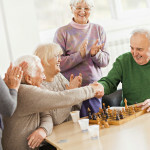 Dignity has taken on an even greater focus as skilled nursing facilities look to create a more “home-like” dining experience for their residents. However, ensuring that your dining room meets this qualification isn’t always easy, so CMS Compliance Group has provided a few tips to avoid dining observation “gotchas” below. Staff can be unintentionally disruptive during meal service. Speaking loudly over the heads of residents who are eating can lower the quality of the dining experience, as can passing food over the heads of residents who have begun eating while others have not yet been provided their meals. Using disposable cutlery and plates is not an acceptable practice for meals. Citations have been given regarding the use of plastic knives and forks since the expectation is that residents would not be eating dinner using disposables in their own homes. Mealtime is often a main social outlet for residents. All residents should be served their meals at the same time and not be rushed through their meals by staff clearing the plates of residents that have finished faster than others. Resident preferences on clothing protectors should be accommodated where possible. Assuming that a resident needs to wear a protector because they may have elected to wear it one time the previous week does not mean that they will always want one. Staff should check with residents as to their preferences at each meal when possible. Good outcomes on the Quality Indicator Survey Dining Observation require an “all hands on deck” approach to dining. The final key to preparing for success in the Quality Indicator Survey is exactly that – prepare! Leverage all available tools to help your staff prepare for your upcoming survey, including with the QIS Dining Observation form, which can be found here. What is your staff focusing on to make the dining experience a quality one for your residents at each meal? Share your tips! Please note that the Dining Observation form has been updated as on 3/6/13 and the link in this post reflects the new revision.